Home2 Suites by Hilton Salt Lake City-East is just minutes away from the University of Utah the Veterans Administration and Primary Children*s Hospital. Explore the heart of Salt Lake City just four miles away where you can visit Temple Square shop at the City Creek Mall or attend a Utah Jazz basketball game at Energy Solutions Arena or a short 20-minute drive to Park City. Want to hit the slopes or hike in Utah*s scenic beauty. Located at the mouth of Parleys Canyon and the Big and Little Cottonwood Canyons are both just less than 10 minutes away. Have an electrical car. No problem. Our 2 Tesla charging stations and our GE charging station are readily available and complimentary for our guests to use. 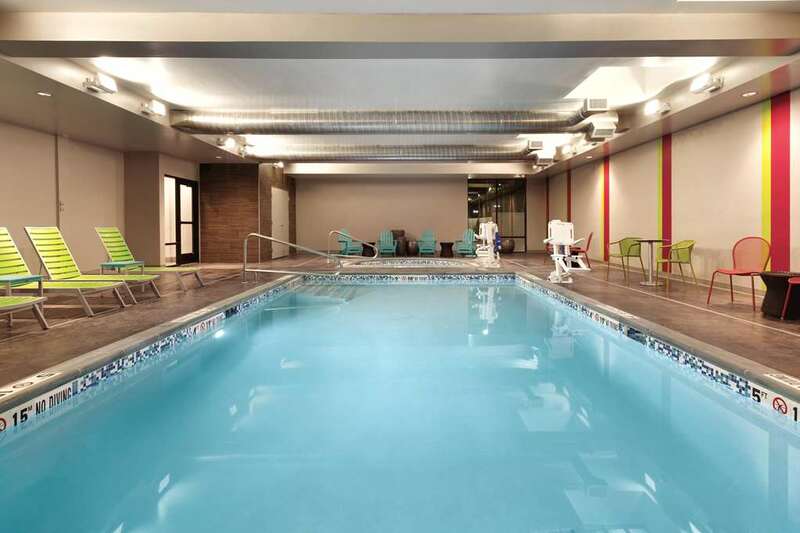 Settle into a contemporary studio or one-bedroom suite at this extended-stay Salt Lake City hotel. The flexible Working Wall stretches the length of the room and features storage an ergonomic chair and a movable table. The full kitchen has a microwave dishwasher refrigerator and all the utensils you*ll need. You can even check-out an induction burner cooktop for free from the front desk. Stay connected with free WiFi or watch movies on the flat-screen TV. Remember to pack the leash - Home2 is your pet*s home too. Join us each morning for free breakfast at our Inspired Table and buy drinks snacks and essentials 24/7 at Home2 MKT. Check emails and print documents in the complimentary business center. Plunge into the indoor saline swimming pool or relax in the bright and welcoming Oasis lounge area as you charge your smart device. Multitask in our unique laundry/fitness facility Spin2Cycle where you can run a load of washing while you exercise. The Black Sheep Bistro: Sports Bar with a variety of beers high point beers cocktails wine and liquor. Amazing food with house made recipes. Pool tables entertainment and Sports Packages. Blue Plate Diner: Classic American diner food featured on Food Network*s Diners Drive-Ins and Dives. Red Butte Cafe: Classic American eats - Deseret Edge beer with a shaded outdoor patio - bustling weekend brunch. Harbor Seafood and Steak Compa: Refined modern restaurant featuring updated American steak - seafood dishes cocktails and wine. Bjorn*s Brew: *Best coffee in Salt Lake city* Bjorn*s Brew is a local coffee shop serving gourmet and specialty coffee all while donating to local animal charities. Ekamai Thai Sugarhouse: Traditional Thai specialties presented in a cool artsy outdoor restaurant with outdoor seating. Taqueria 27: This Mexican eatery serves contemporary takes on Latin American street foods plus high-end tequilas.